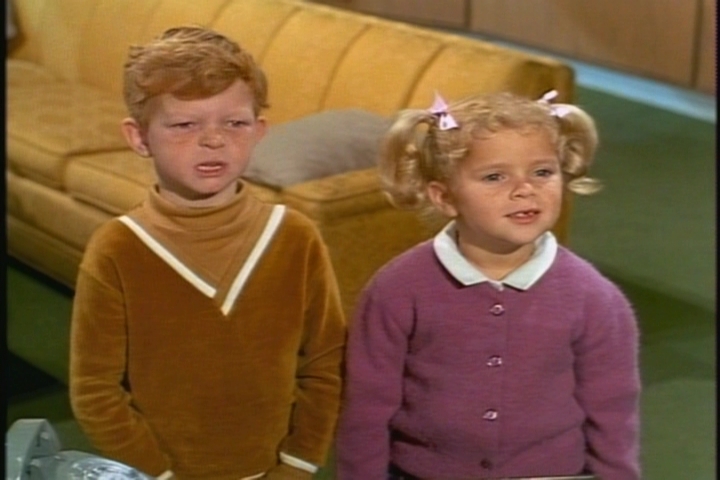 Welcome to this delayed edition of Family Affair Friday! I’ve emerged from my camping adventure unscathed, if unrested, and ready for another installment of Davis family fun. Written by: Ed James and Seaman Jacobs. Directed by: William D. Russell. As the show opens, the twins are getting on everyone’s nerves. 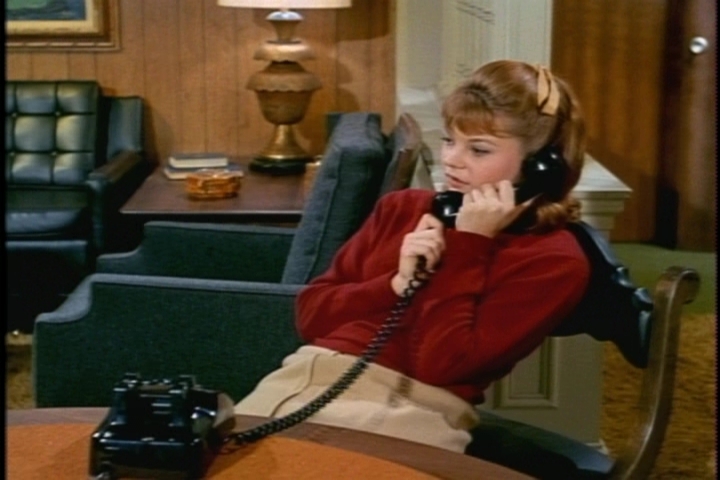 Jody makes one his anti-girl cracks, which Cissy doesn’t appreciate. She orders him to get lost. 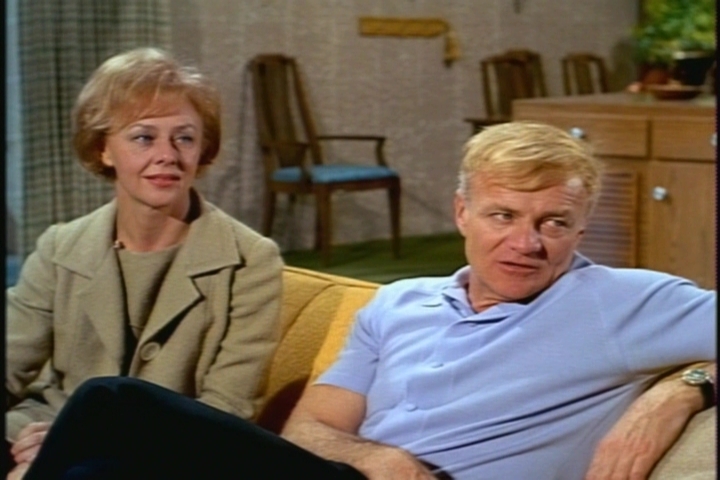 Meanwhile, doesn’t Mrs. Beasley look forlorn? Maybe she senses what’s coming next. 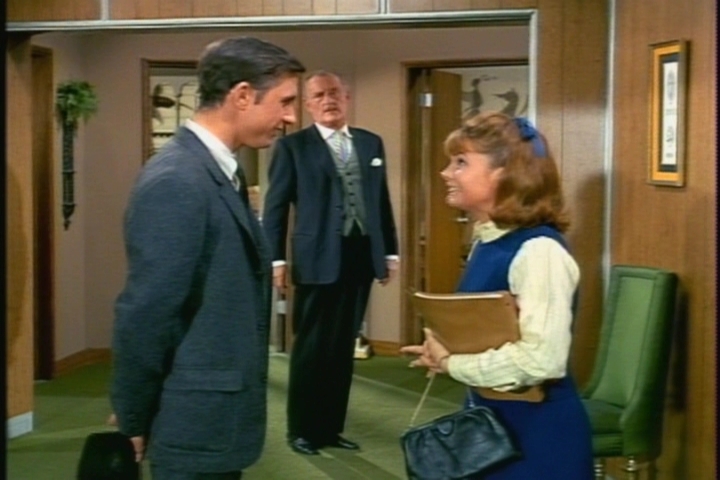 Jody leaves the girls’ room, but not before swiping Mrs. Beasley. Much running and screaming ensues. 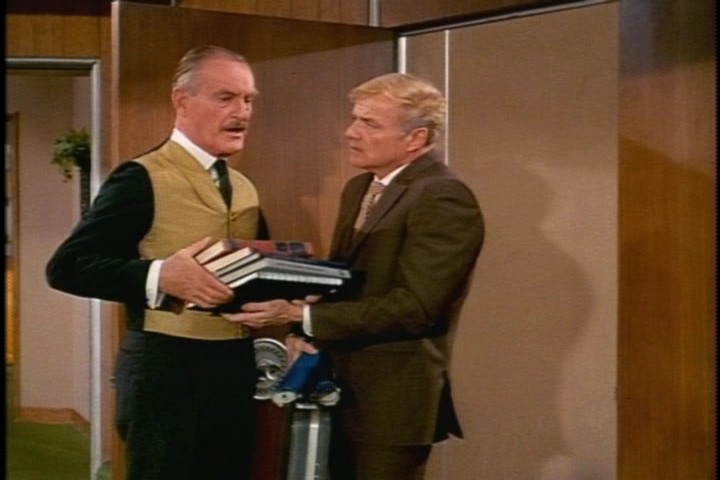 Mr. French has had it, so he lowers the boom: No TV for two nights. 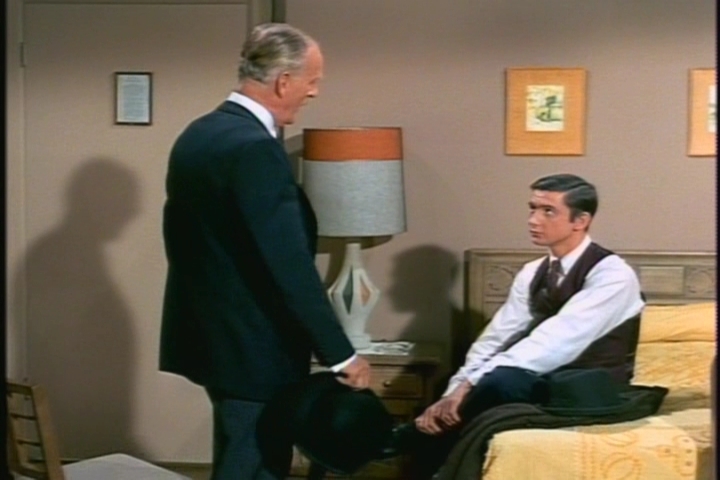 Almost immediately he begins to doubt his disciplinary actions–was he being too harsh? Nigel is definitely the sensitive French brother. 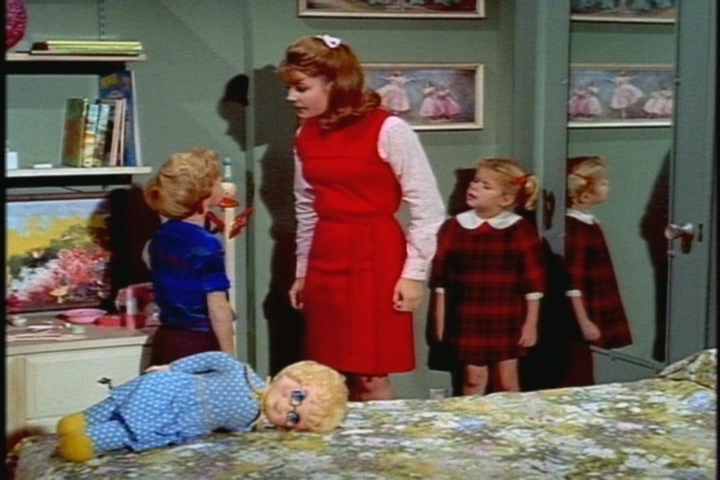 Punishing Buffy and Jody was a favorite activity for Giles French. 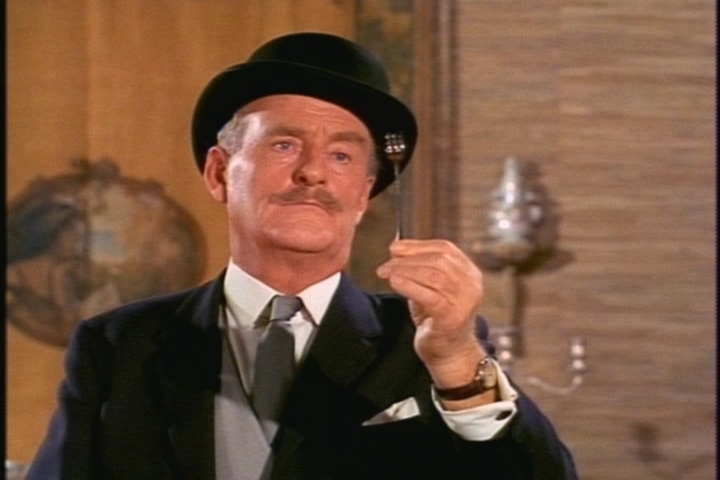 French picks out the perfect present–a sterling silver pickle fork! The marriage conversation gives the twins a brainstorm–never a good thing. They are determined to find a Mrs. French! Ah, here’s a likely candidate. 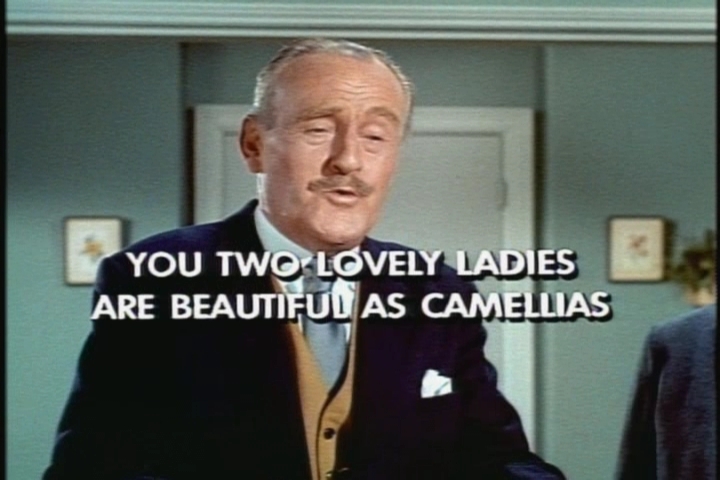 The twins try to play matchmaker between French and Miss Faversham. French, however, jumps to the conclusion that the twins want to replace him with Miss Faversham because he’s been too tough on them. 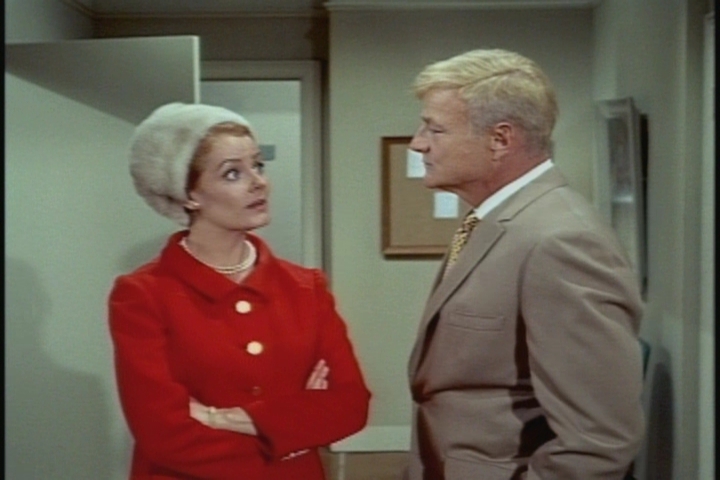 Suddenly, it’s liberty hall at the Davis apartment. 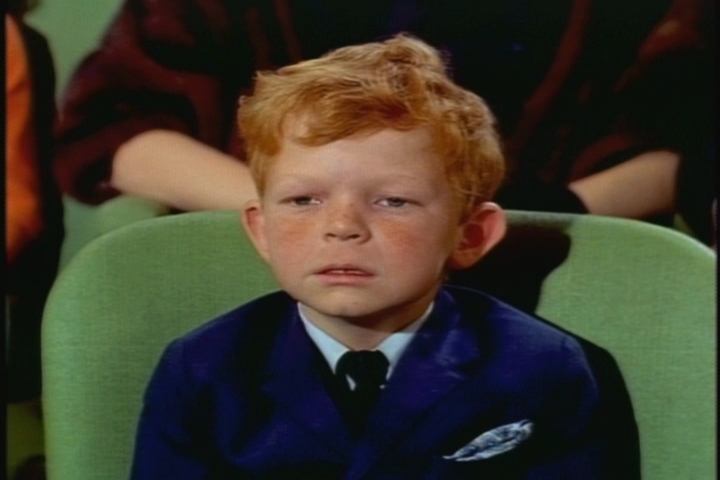 TV before homework and cookies and punch before dinner–yes, Jody, this is shocking. 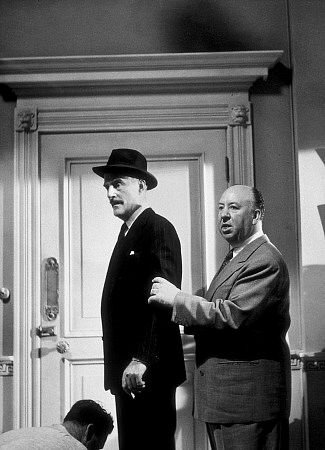 Soon, however, French catches the kids inspecting his room to see if Miss Faversham would like it. 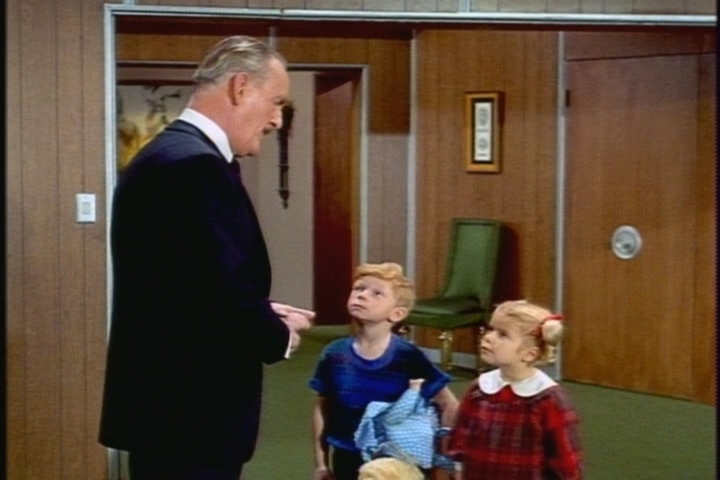 Luckily, Cissy gets wind of their ideas and fills in Uncle Bill, who gets the whole scheme out of them. French is touched to hear how concerned the kids were about his happiness. 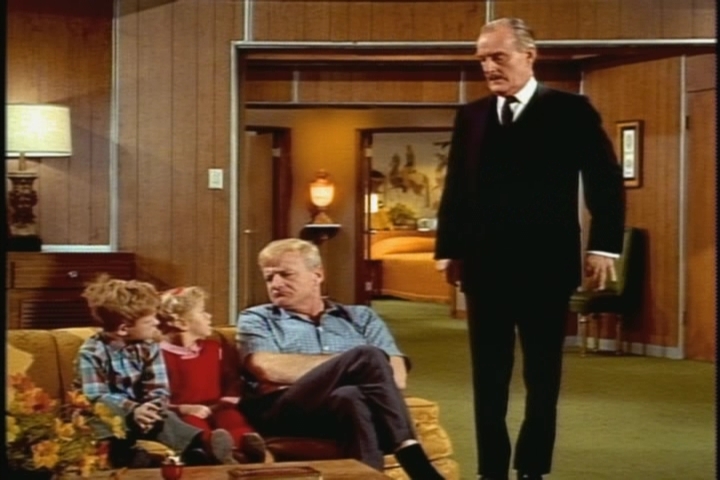 The three have a sweet talk about marriage, and Uncle Bill explains that each person must find happiness in his or her own way. Interestingly, Uncle Bill also expresses his own determination to marry one day. Jody, on the other hand, is a budding confirmed bachelor. 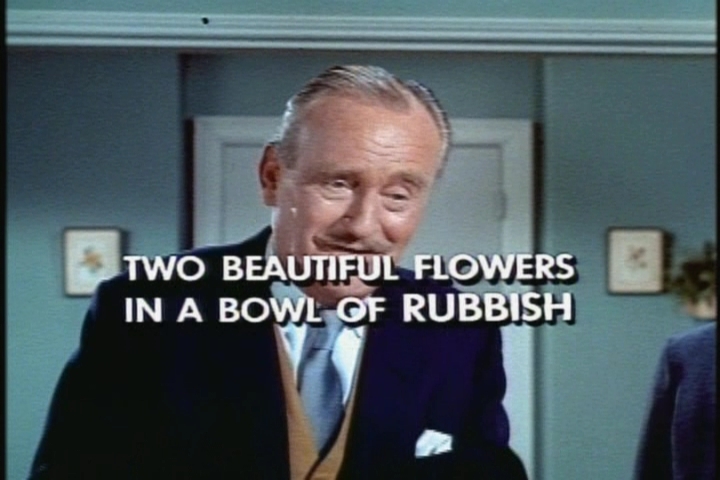 The concluding talk is definitely the highlight of this episode. Structurally, the plot is unsatisfying, with an abrupt resolution. 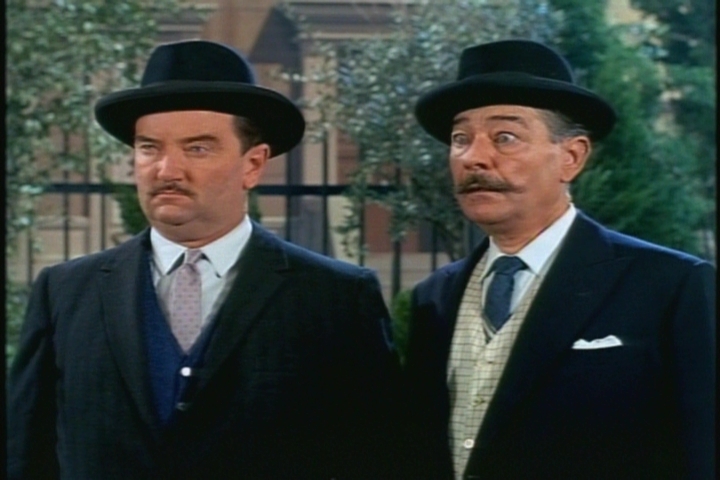 Withers: Richard Peel. Peter: Kevin Cooper. Clerk: Pitt Herbert. Miss Faversham: Heather Angel. 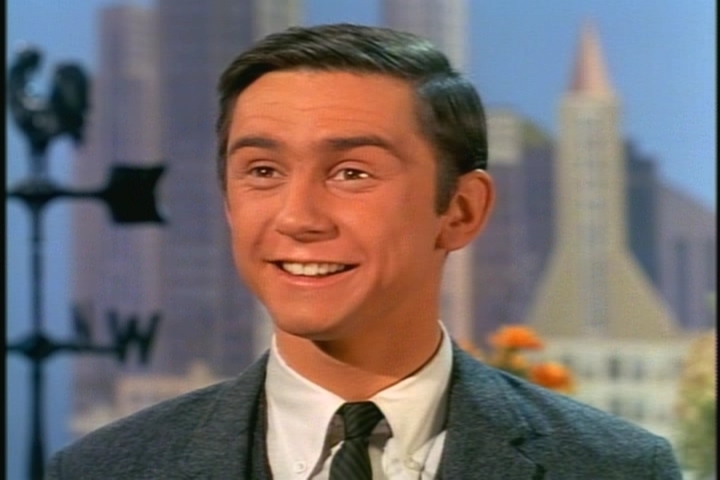 Herbert was a frequent TV guest star who played a toy store owner in two Brady Bunch episodes. 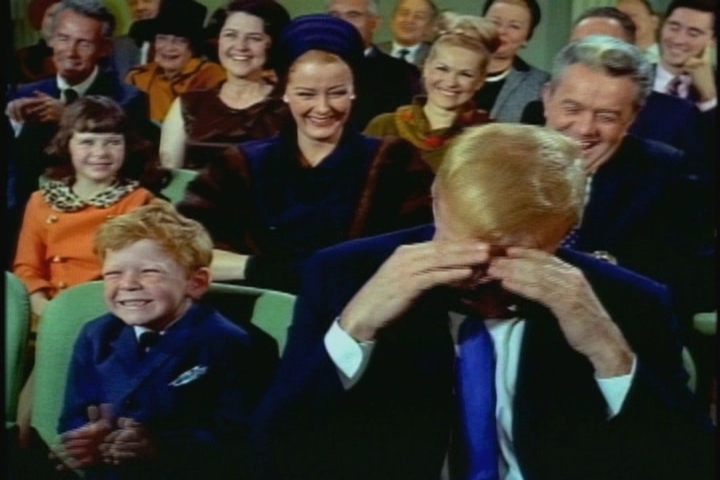 He also had small parts in such films as Hud, Dear Brigitte (John Williams also appeared) and The North Avenue Irregulars. 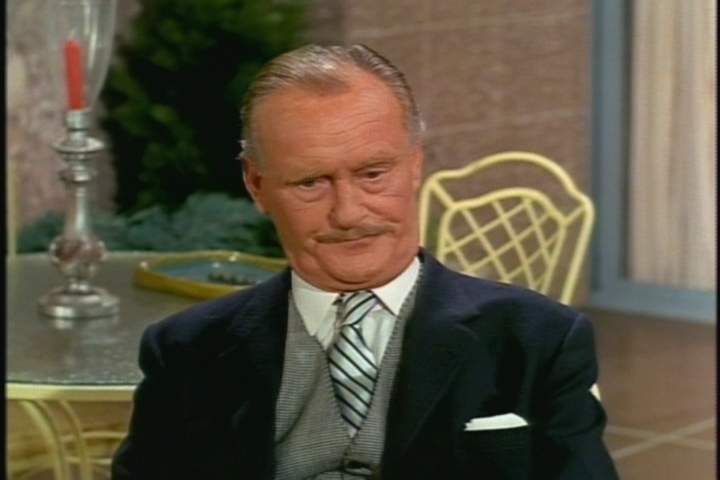 He had a recurring role on Perry Mason as an autopsy surgeon. 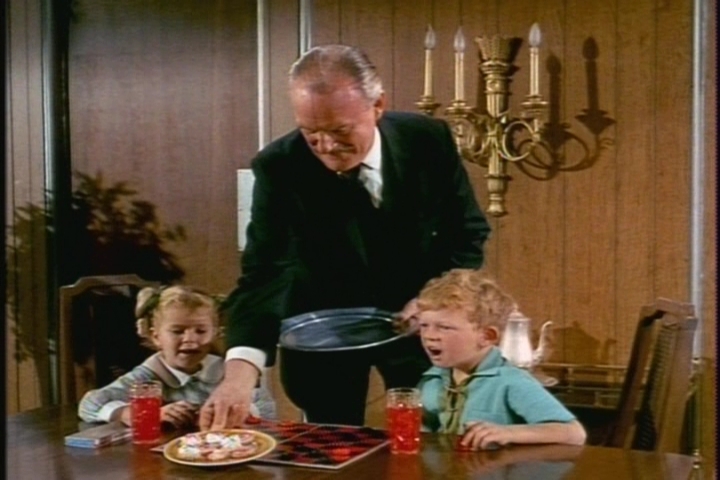 Random observation: Uncle Bill was having a bit of a wardrobe malfunction with his tie here. 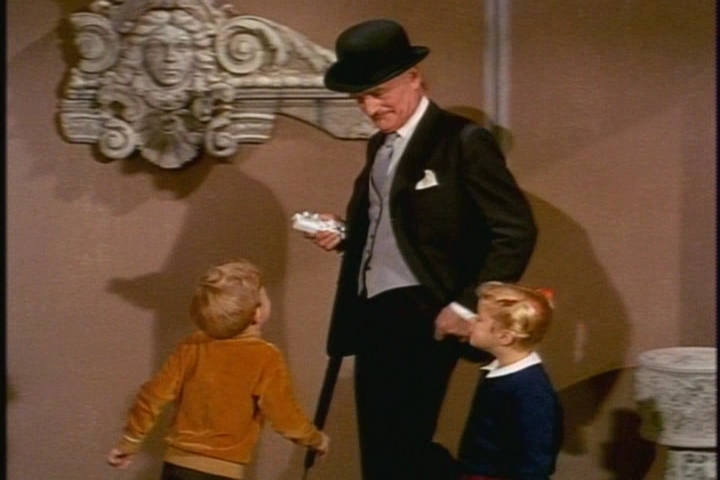 What would Giles French think of the kids’ attempt to fix Miss Faversham up with his brother? Random literary observation: Some of Jody’s books look like Hardy Boys and Nancy Drew volumes. Did boys read Nancy Drew in the ’60s? This French has the same day off as his brother–Thursday. 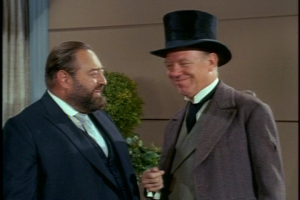 Nigel French mentions his brother in this episode. At least he remembers him. Buffy, who could perform multiplication in the past, cannot subtract 6 from 15. Random ugliness: Nice hallway decor. 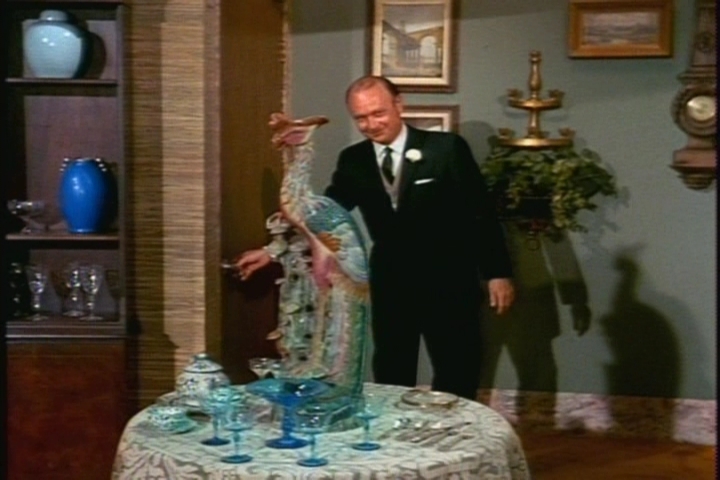 Uncle Bill’s lame interior decorator friend must have performed her magic on the whole building. Welcome to Family Affair Friday, appearing on an actual Friday this week! 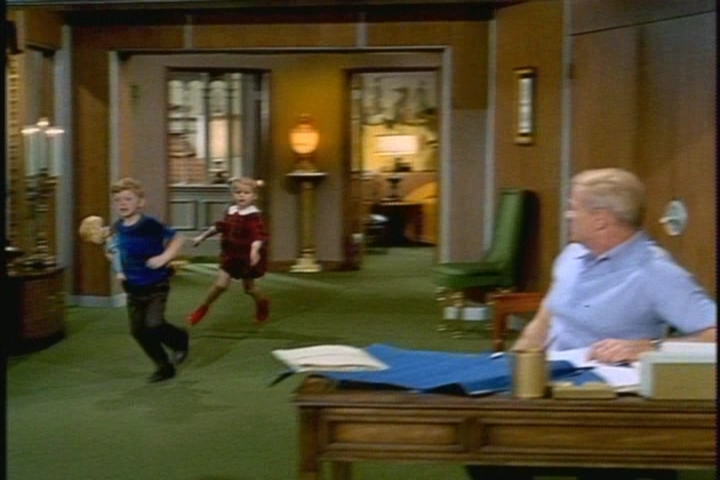 In this episode we learn the twins’ bedtime, the general location of Uncle Bill’s office, and the limits of Mr. French’s linguistic abilities. 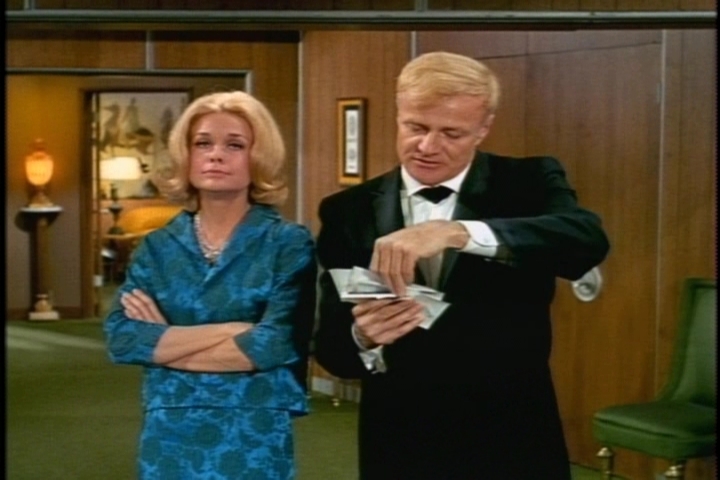 We also get to see the only Family Affair guest cast member who was also a stripper. At least, I think she was the only one. It’s 8 p.m. in the Davis household, which means it’s bedtime for Buffy and Jody. 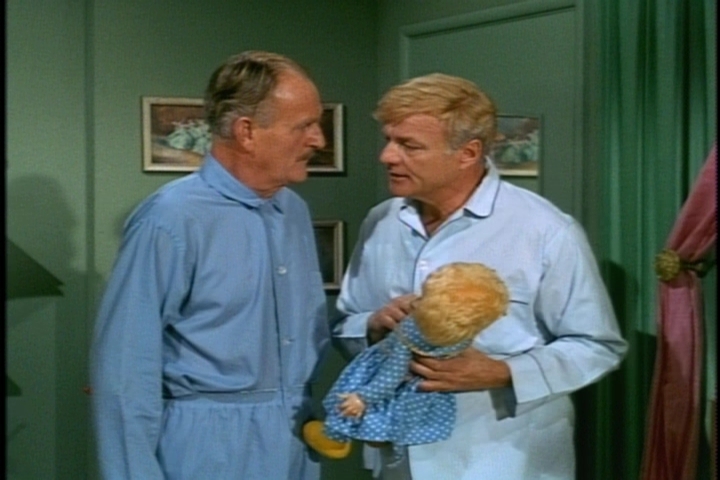 The twins plead for a later bedtime, telling Uncle Bill that their new friend Marilyn gets to stay up to 8:30. Uncle Bill sends them off to bed anyway. I don’t blame him. I think I’d be tired of Buffy and Jody by 8 o’clock, too. The next day, the twins continue to rave about their new friend, who has inspired them to adopt higher standards of politeness and neatness. They even give French a bow and curtsy as they leave the breakfast table. Naturally, he’s baffled. When French meets Marilyn, he quickly discovers that she doesn’t speak English. He finds himself in the first of several bowing standoffs with her. 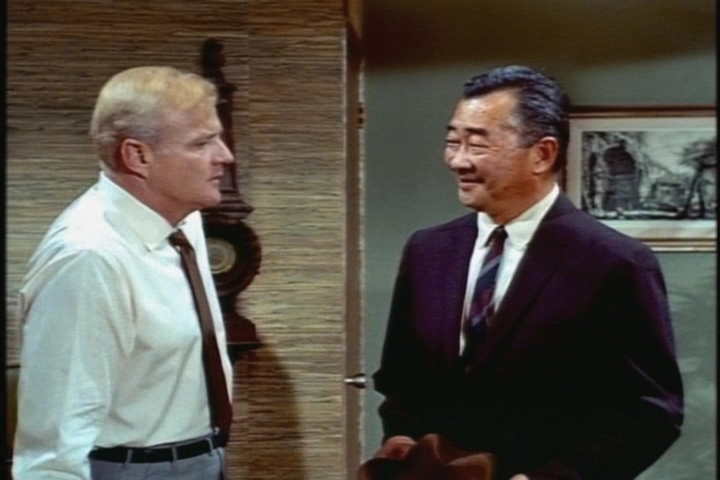 You know, that old TV trope–a non-Asian person meets an Asian person, and the Asian person bows, so the non-Asian person bows back, and then the Asian person bows again, and so on? Yes, it’s quite tedious. 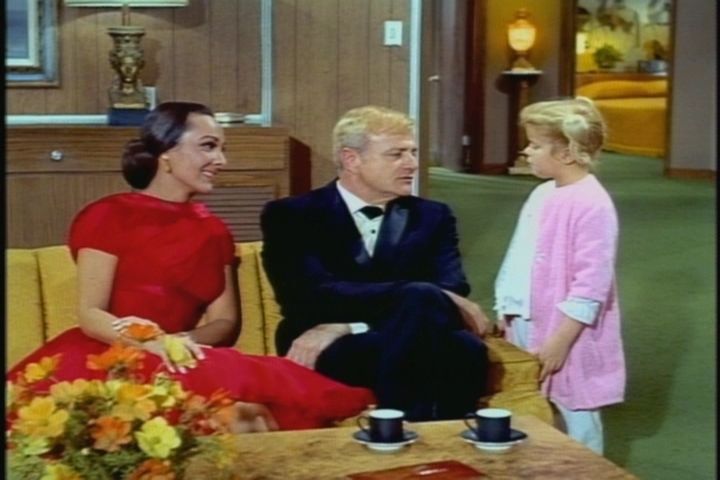 French and Uncle Bill marvel at the ease with which Buffy, Jody, and Marilyn play, despite their language barrier. 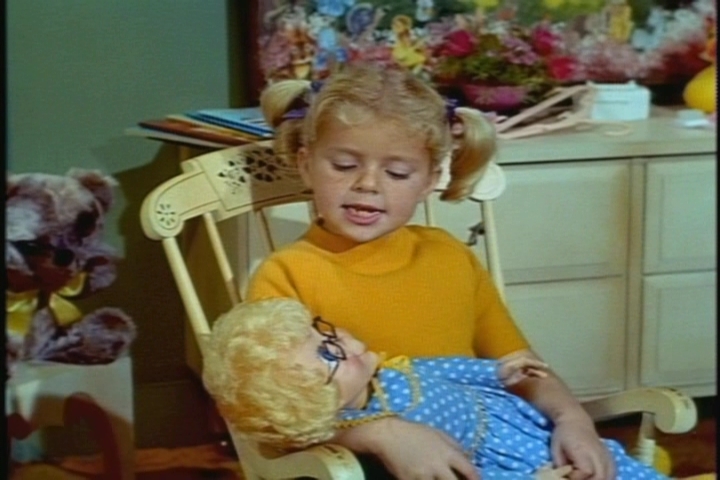 Look, Buffy owns another doll besides Mrs. Beasley. I don’t know what kind of doll it is, but I’d bet Mattel made it. Unfortunately, French decides to brush up on his own Cantonese so he can communicate with Marilyn. The next time she comes over to play, he tries to tell her that she has the eyes of a fawn and the face of an angel. Marilyn, understandably, flees in horror. 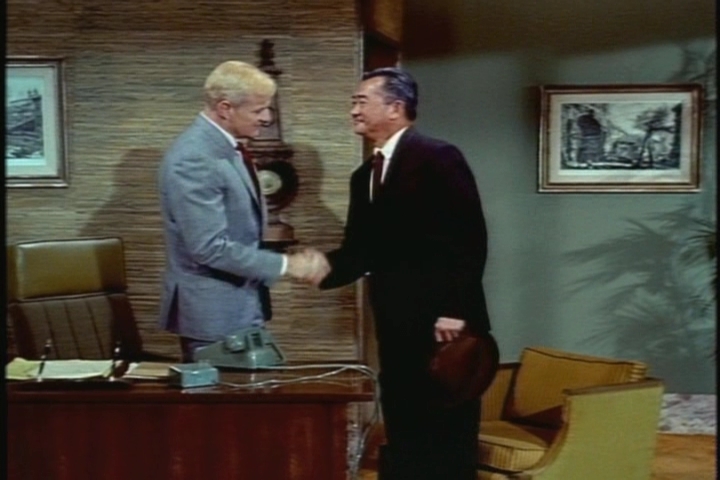 Marilyn’s father, a member of the Chinese delegation to the UN, pays Uncle Bill a visit at the office. 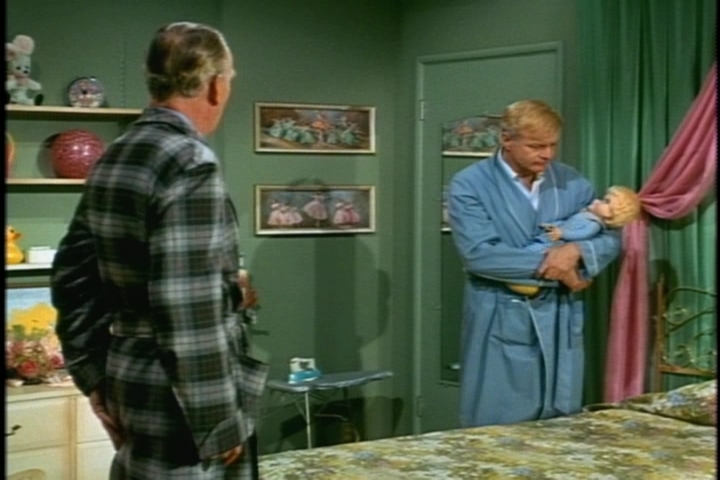 He explains French’s mix-up and tells Bill how upset Marilyn’s mother and grandmother are about the inadvertent insult. 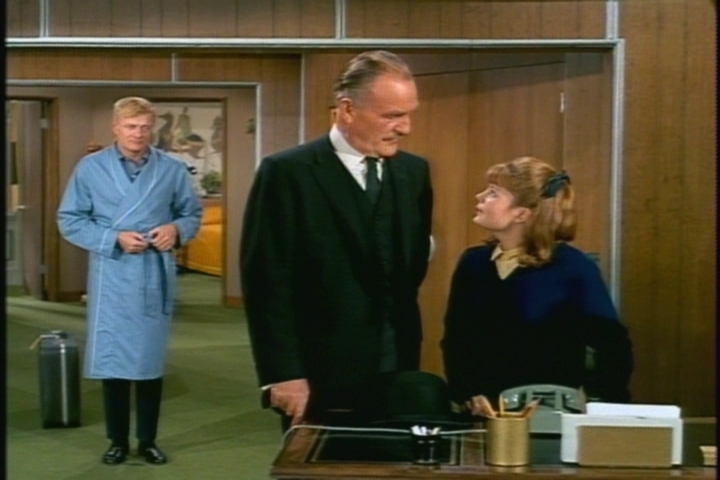 This prompts another visit from Marilyn’s father to Uncle Bill’s office. Hmm. 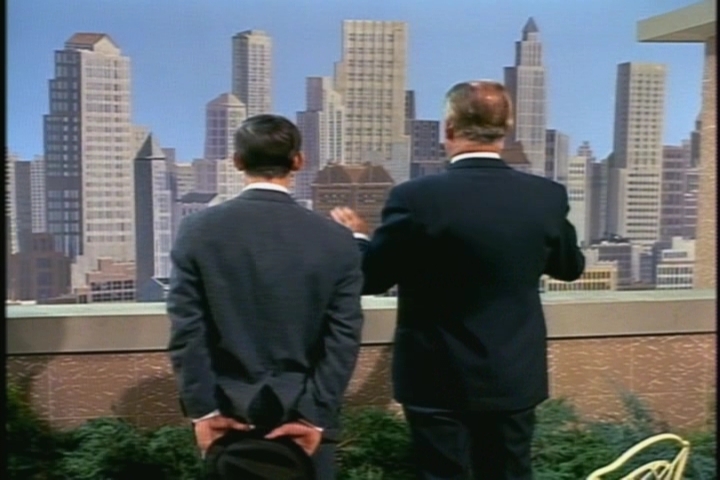 The UN is between 42nd and 48th streets, and Uncle Bill thanks Marilyn’s father for coming “downtown” to his office. 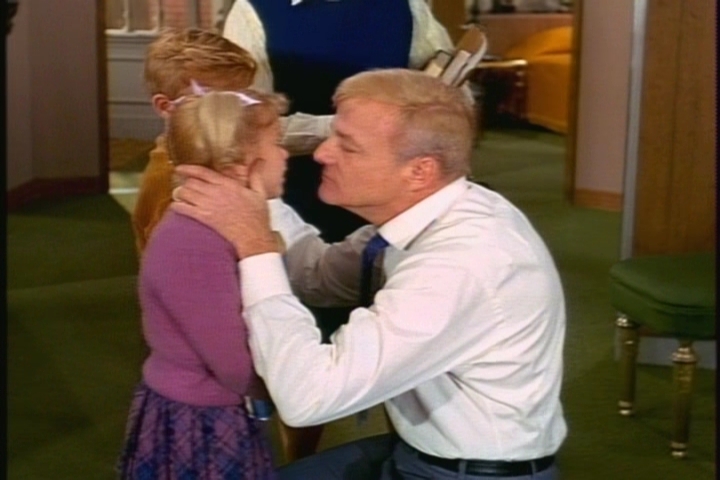 To solve such a small problem, Marilyn’s father is really going out of his way. 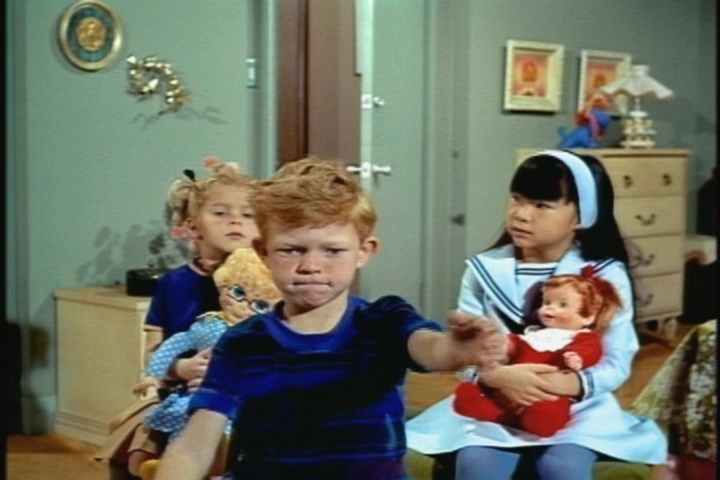 Bowing to the wishes of his wife and mother-in-law, Mr. Chen bans Marilyn from playing with Buffy and Jody. Marilyn, we hardly knew ye. Facing the twins’ wrath, French decides to pay the Chens a visit. Yes, Marilyn, I’d be wary, too. Greeting Mrs. Chen and her mother, French gets off to a good start. Unfortunately, he doesn’t leave it at that. 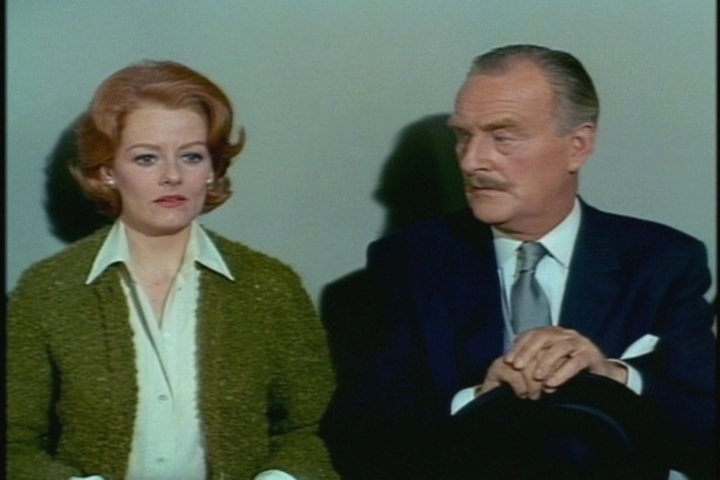 Marilyn, however, begins to see the humor in French’s well-meaning attempts. 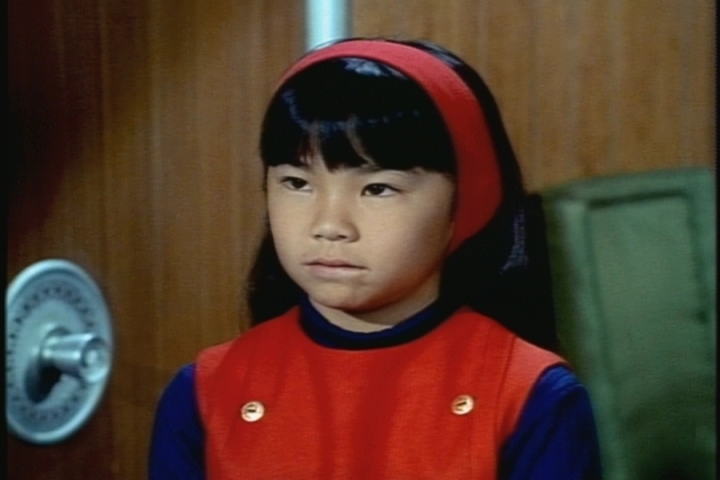 Soon, the whole Chen family realizes that French meant no harm. 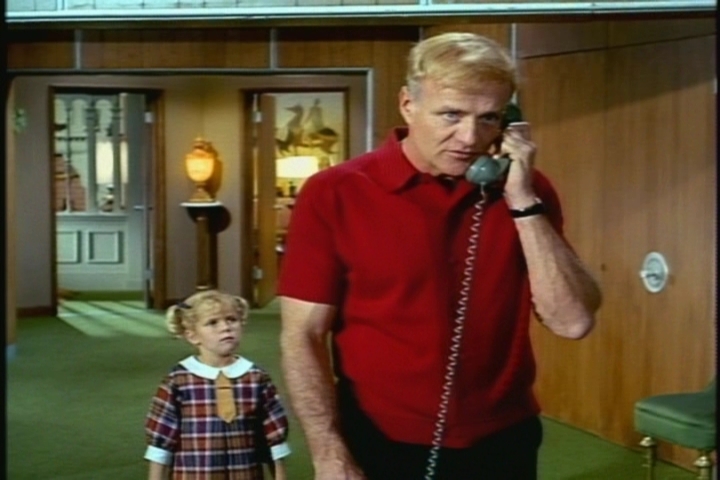 By the end of the episode, Buffy and Jody have picked up some Cantonese, and Marilyn is learning English (such as “color television”). 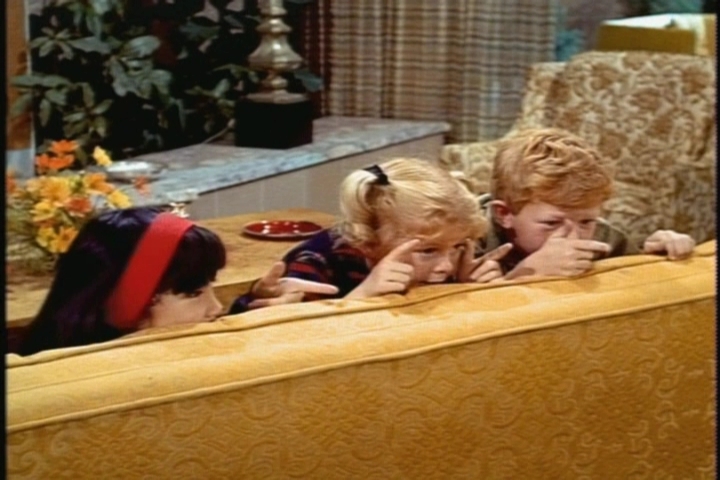 As French and Uncle Bill look on fondly, the three children indulge in some imaginary gun play. Oh, Marilyn…You’re going to fit in here just fine. 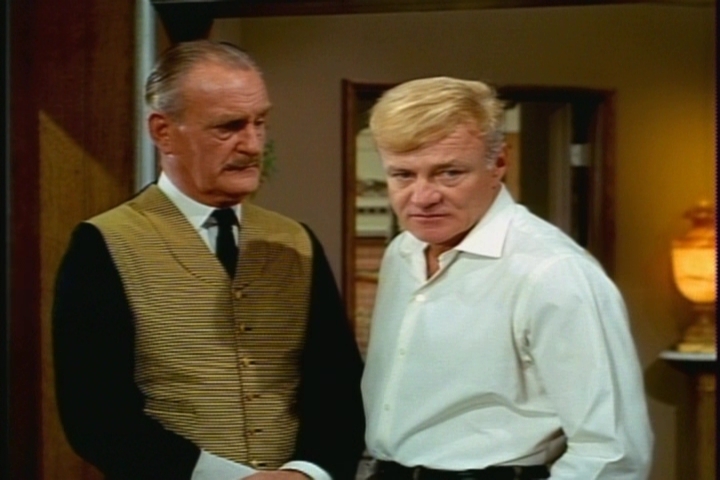 A nice aspect of Family Affair is the cosmopolitan world the Davises inhabit. They interact with people across a wide range of ethnic, racial, and socioeconomic backgrounds. 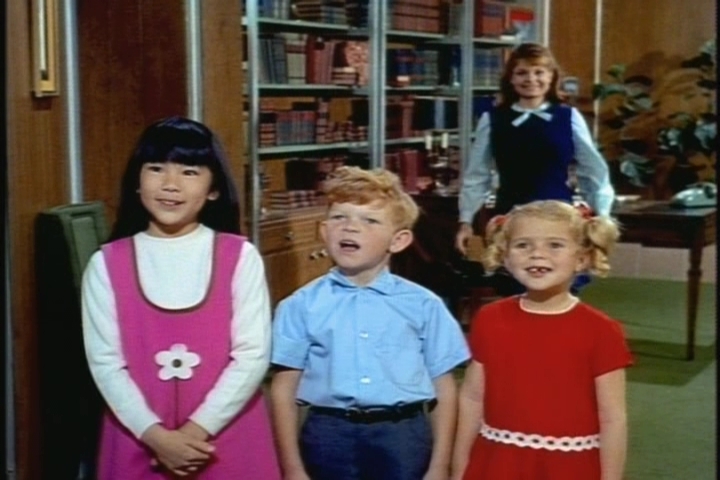 I like the way the kids in this episode communicate across the cultural barrier with ease, while the adults struggle a bit. And the translations of French’s compliments are funny. 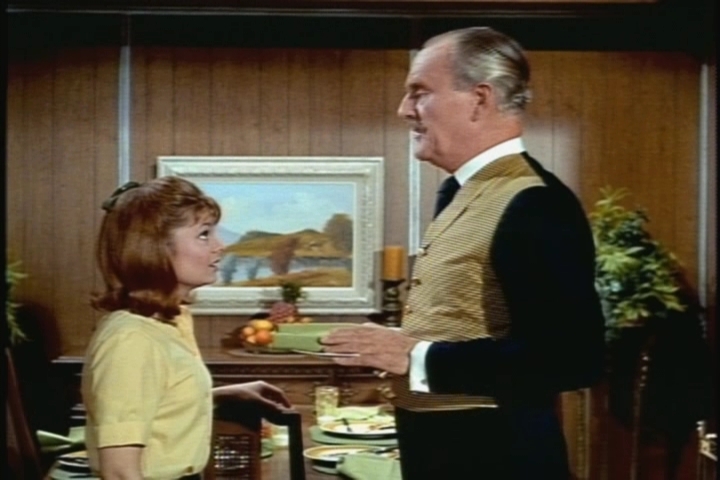 Random observation: John Williams is really tall, and Kathy Garver is really short. Mr. Chen: Richard Loo. Marilyn: Lisa Fong. 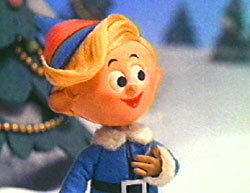 Mrs. Chen: Noel Toy. Grandmother: May Lee. 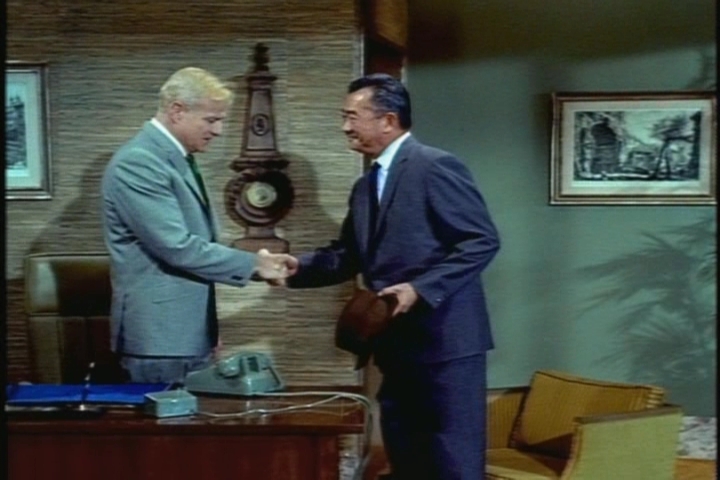 This capture is from the third visit Mr. Chen paid to Uncle Bill’s office. He must have really liked getting away from the UN. 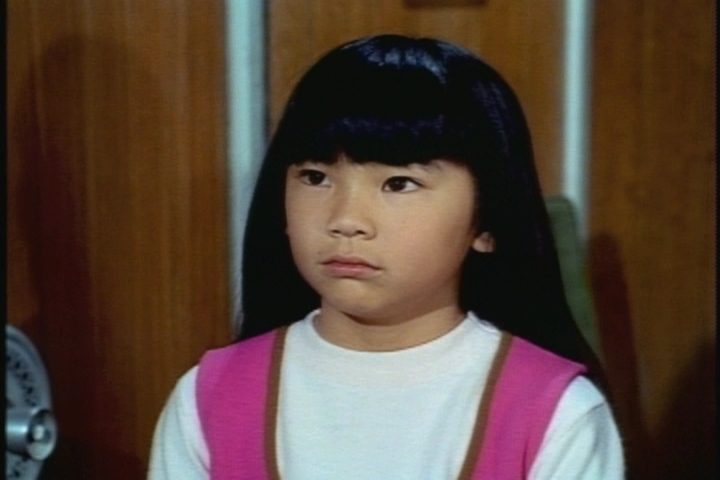 Richard Loo had an active film career within the limits imposed on Asian-American actors of his time. 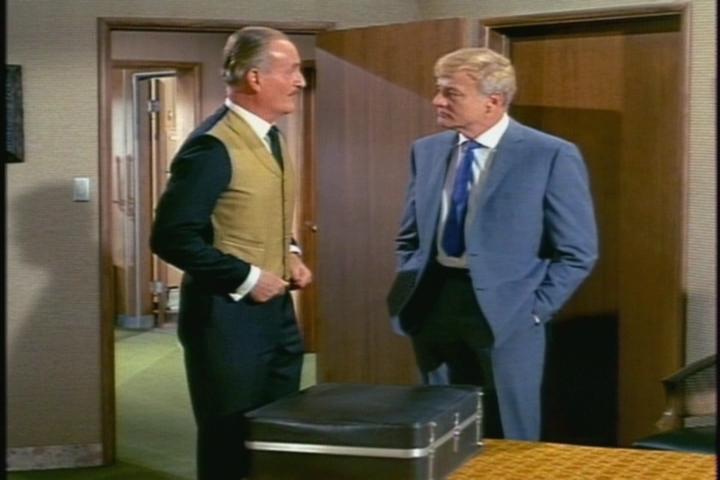 He played Japanese characters in many World War II-era movies including Wake Island (Brian Donlevy from Episode 15 starred), Flying Tigers, and God is My Co-Pilot (with Andrea King from Episode 17). 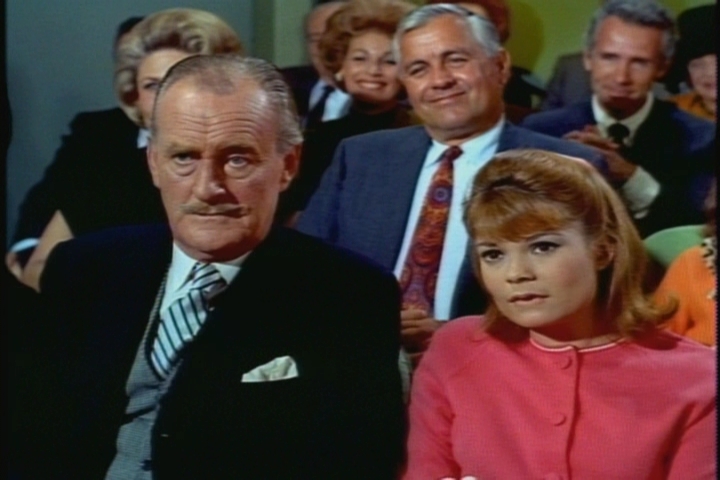 Later films included Love is a Many Splendored Thing, Around the World in 80 Days (the large cast also included Katy Koury from Episode 8) and The Man with the Golden Gun. 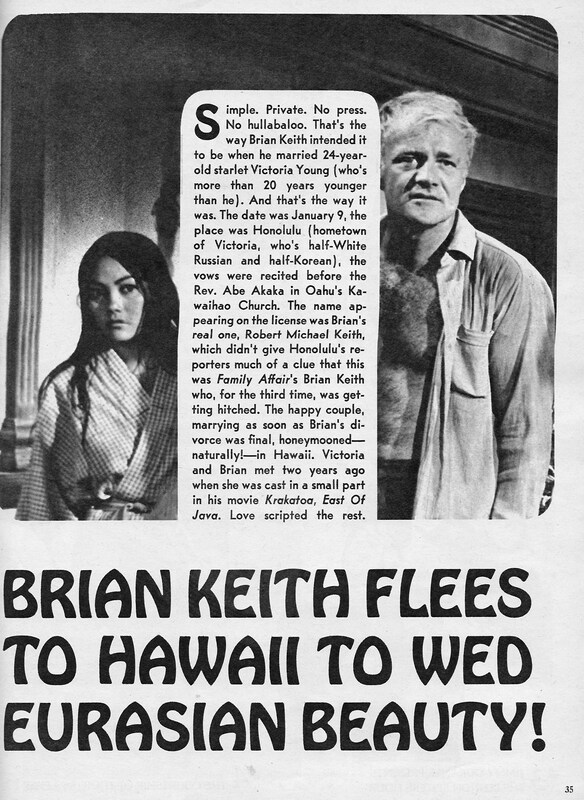 He was Master Sun on TV’s Kung Fu and made guest appearances on many shows. 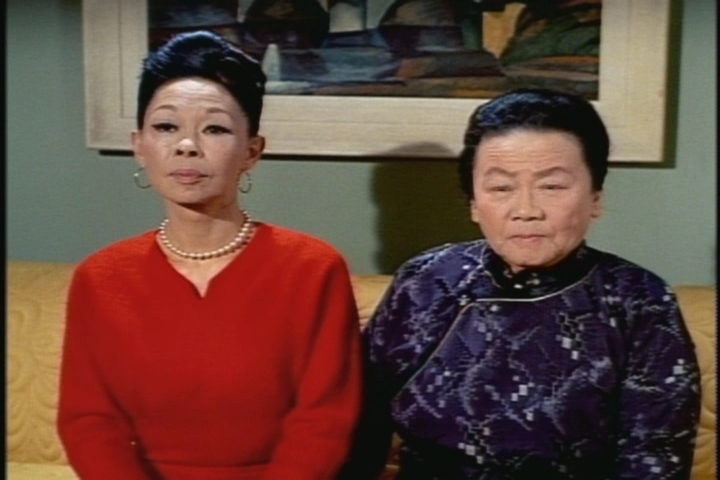 Lisa Fong’s father was actor Benson Fong, who will show up three times in later Family Affair seasons. Welcome to Family Affair Friday! 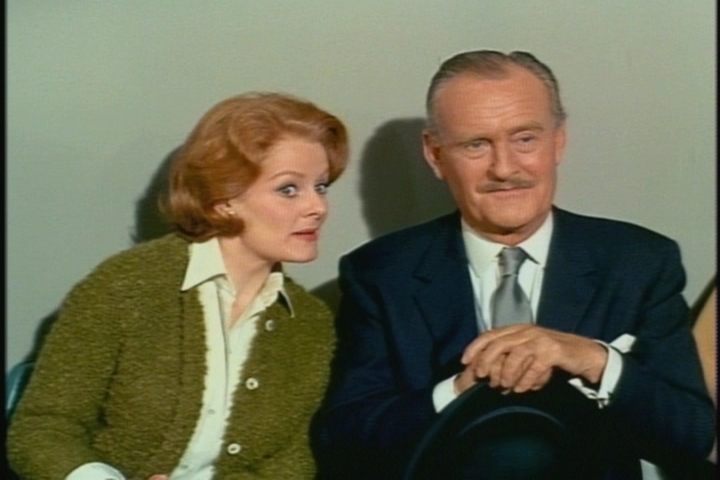 You know, one of these days I might just change the title of this series to Family Affair Saturday. Hate to lose the alliteration, though. 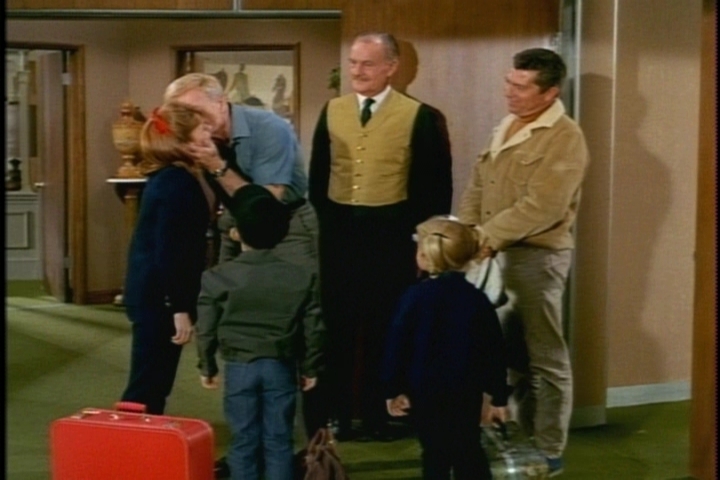 Today’s episode gives us lots of Buffy cuteness and a look at a very lucky lady–Brian Keith’s real-life wife. Written by: Edmund Beloin & Henry Garson. Directed by: William D. Russell. 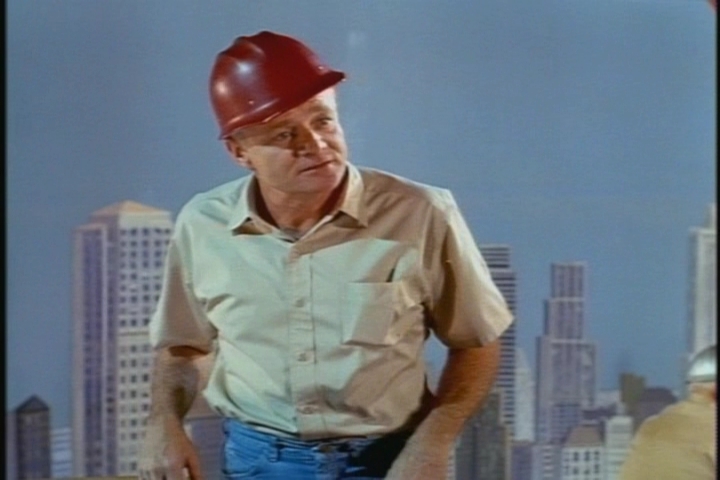 Our opening teaser finds Uncle Bill working high above a completely realistic Manhattan skyline. 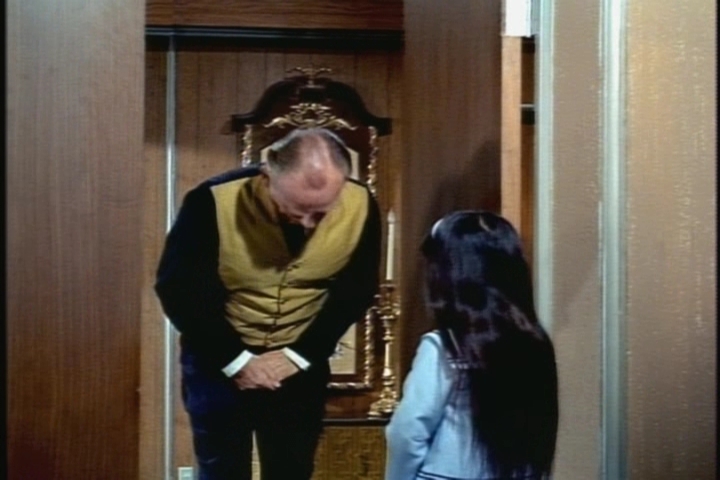 An underling conveys a message to him: His niece has torn her tutu. The worker thinks this means she suffered an injury–I wonder what body part he thinks a tutu is. Now we know we’re in for a ballet-themed episode, so it’s no surprise that our next scene opens in typical ballet studio, complete with Russianish instructor. Pretty big range of sizes represented in this class. After class, the instructor talks about an upcoming Little Red Riding Hood recital. French is sitting with the ballet moms, one of whom confides that she expects her daughter Melissa to get the lead role. 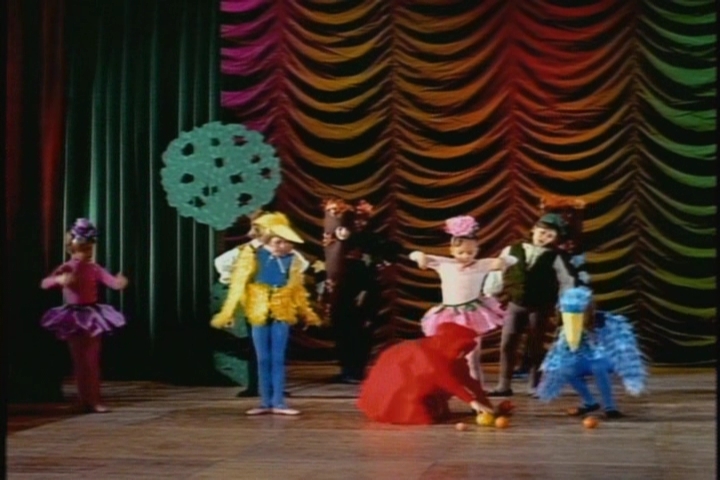 The ballet teacher introduces a famous ballerina, Margo Dunbar, who will direct the recital and who has cast the roles. 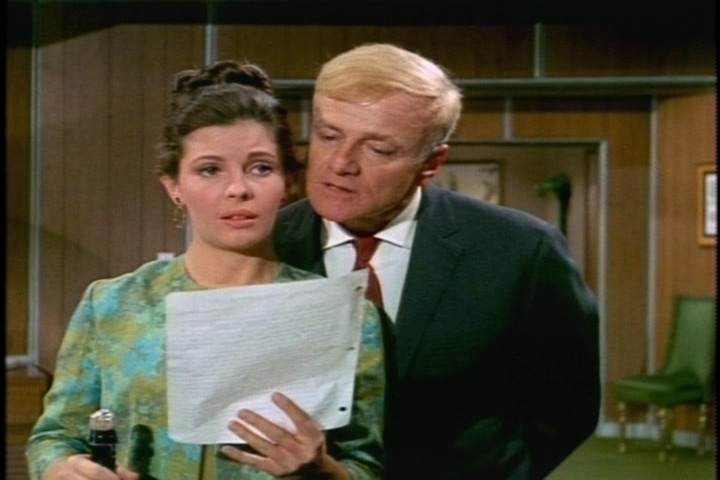 Margo is played by Judith Landon, Brian Keith’s wife. They married in 1954 and would divorce in 1969. I’m sure she had a lot going for her, despite whatever is going on with her eyebrows here. She cast Buffy as Little Red Riding Hood and Melissa as the wolf. Melissa’s mother takes this well. 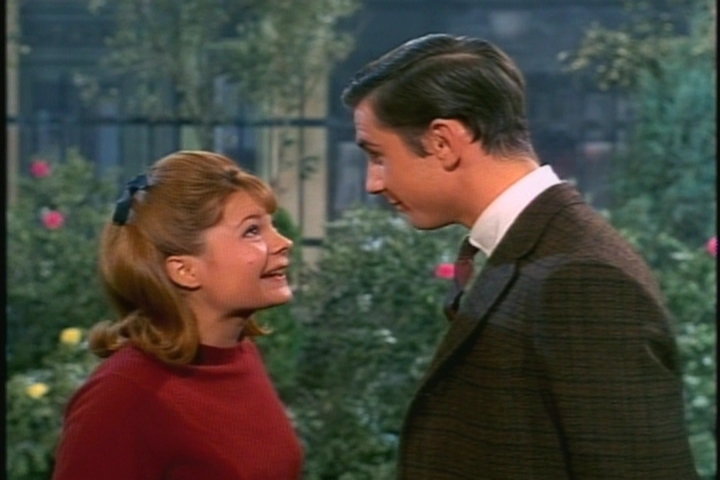 French talks to Miss Dunbar after class, and she discovers that Buffy’s Uncle Bill is the same Bill Davis she once dated in Venice (he tipped over the gondola they were riding in, which somehow kept her from performing Swan Lake that night). 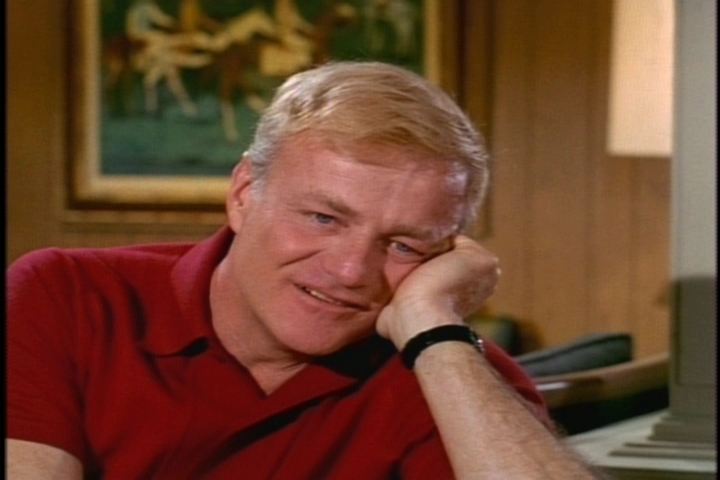 Uncle Bill must have enjoyed that Venice escapade. 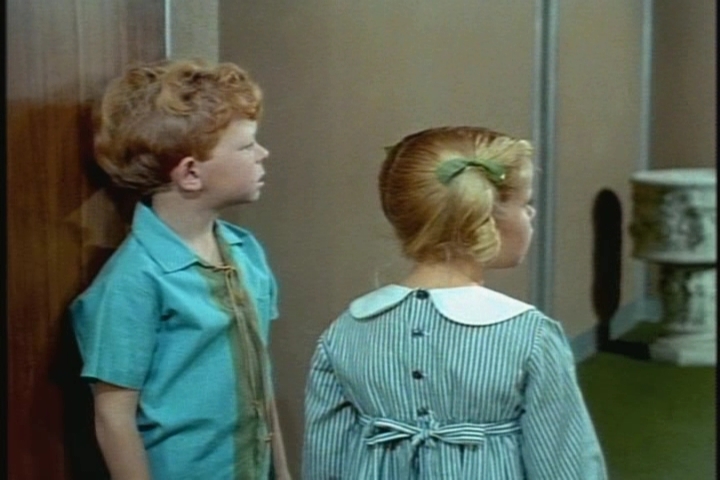 When he hears Margo’s in town he take the bold step of accompanying Buffy to ballet class himself the next day. They are quickly on “honey” and “dear” terms, a situation not lost on Melissa’s mother. 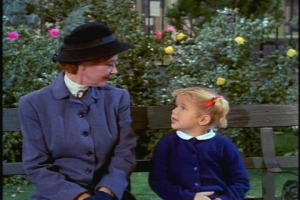 Margo visits the Davis home and tells Buffy how much potential she has as a dancer. 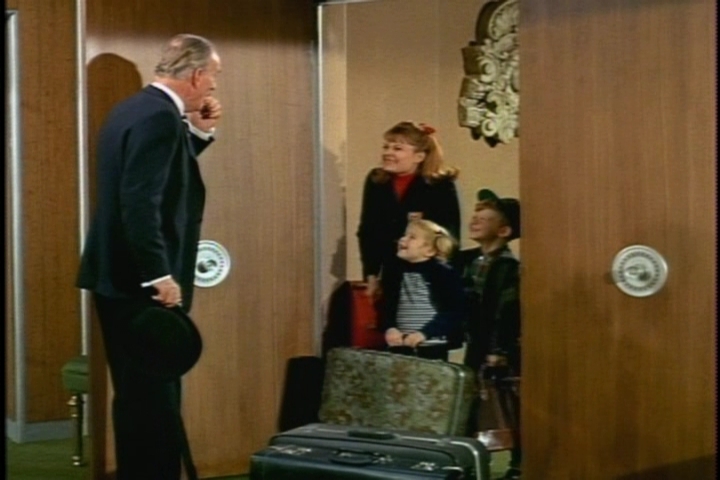 Bill and Margo tell Buffy she might become a ballet star, touring the world. Buffy assumes they mean that she’ll have to start touring right away, which triggers her well-founded separation anxiety. Commiserating with Jody, she suddenly realizes the answer to her dilemma. She’ll just perform really, really badly in the recital! She starts by spilling her basket of goodies across the stage. 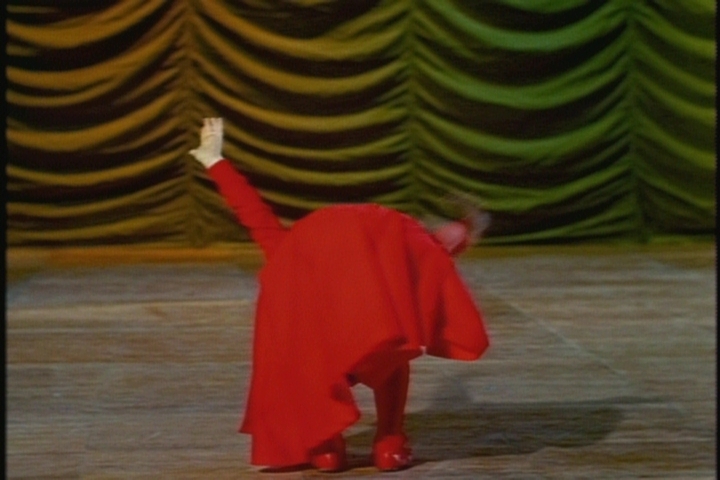 …she closes with a backwards bow. 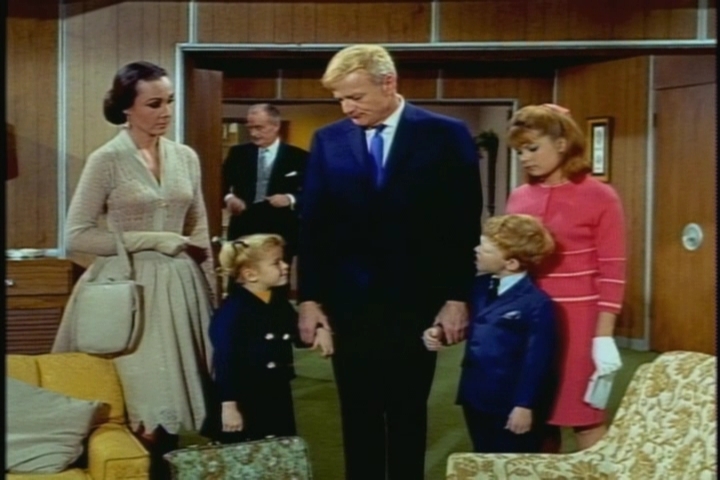 At home, the family commiserates, while an exultant Buffy confides in Mrs. Beasley. This is a cute episode. Buffy’s separation anxiety makes sense, and her bad ballet performance is fun. 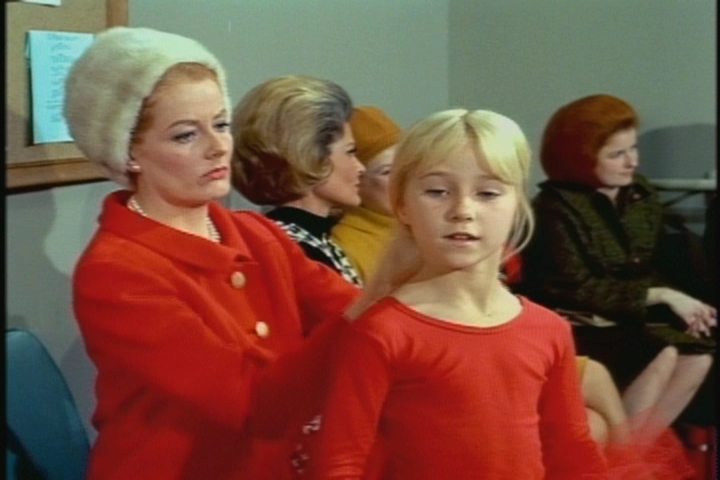 Another plus: A chance to see Anissa Jones in something other than her signature hair style. Margo: Judith Landon. Mr. Nelson: Frank Maxwell. Clara: Ann McCrea. Madam Leonton: Lili Valenty. Melissa Nelson: Cindy Eilbacher. Seegar: John Lawrence. 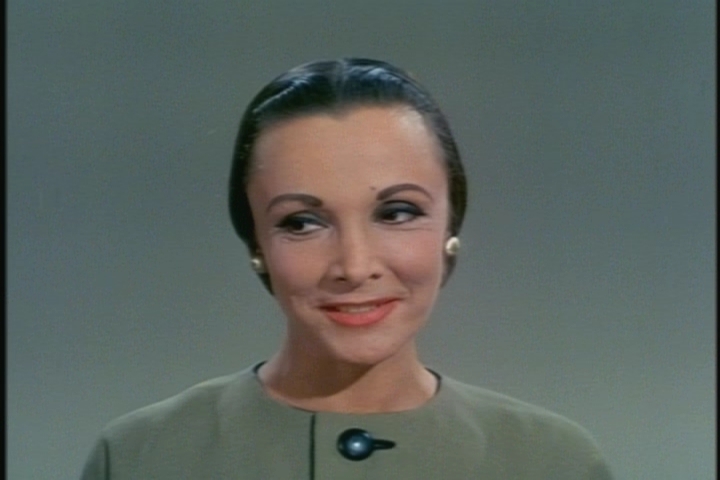 Judith Landon appeared as a background dancer in several 1950s movies. 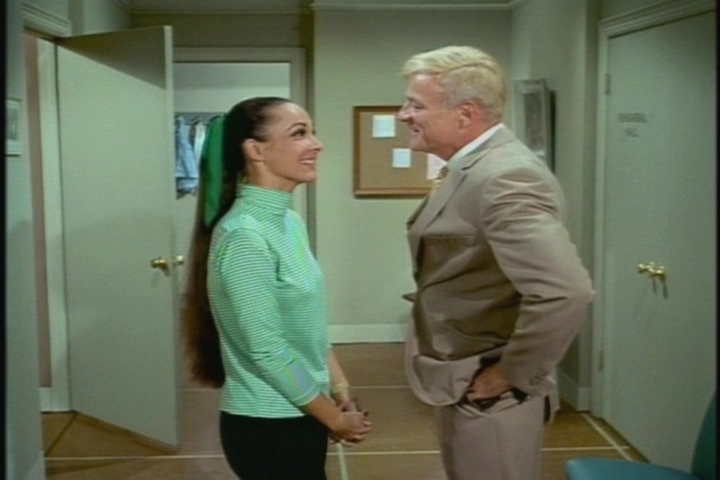 She would play a ballet teacher in a 1973 Brady Bunch episode–the one where Jan tries desperately to find a talent. Okay, one of the ones where Jan tries desperately to find a talent. 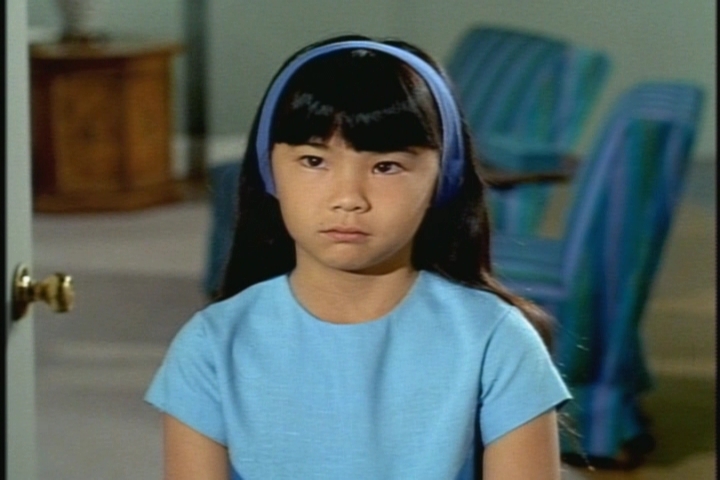 While Melissa’s parents haven’t changed since Episode 7, she has morphed from Pamelyn Ferdin to Cindy Eilbacher. 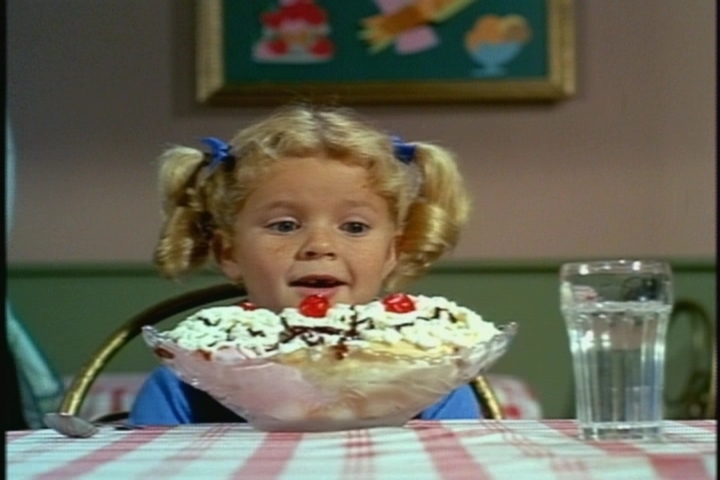 Cindy Eilbacher was a fairly prolific child and young adult actress. 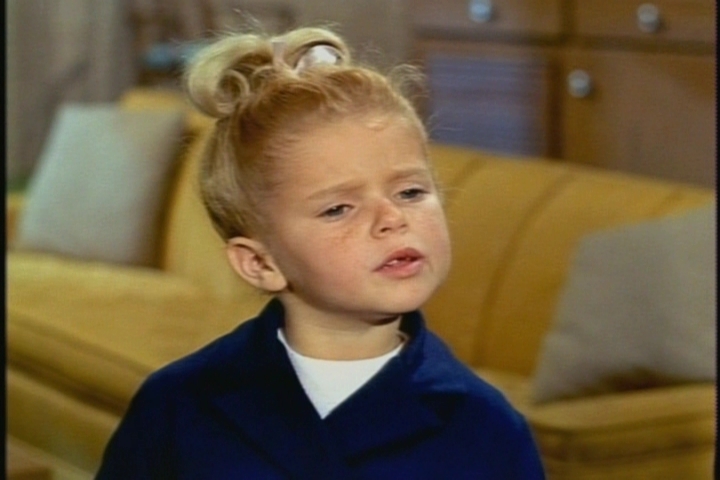 She was the daughter in My Mother the Car (Randy Whipple, who played her brother in that series, is a Family Affair standby) and appeared in many TV movies. 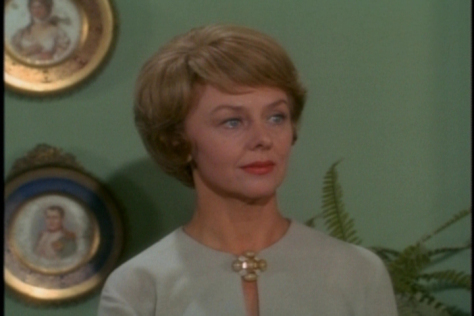 She played April, Paul Williams’ first wife, on The Young and the Restless in the early 1980s and again in the early 1990s. 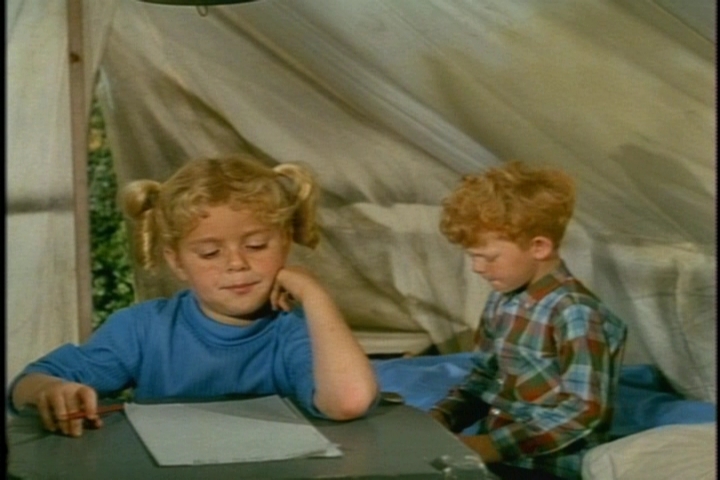 Her sister, Lisa Eilbacher, was also an actress. French says he enrolled Buffy in ballet as part of an “anti-clomping about the house campaign.” But Buffy began ballet in Episode 9, before Nigel French’s arrival. 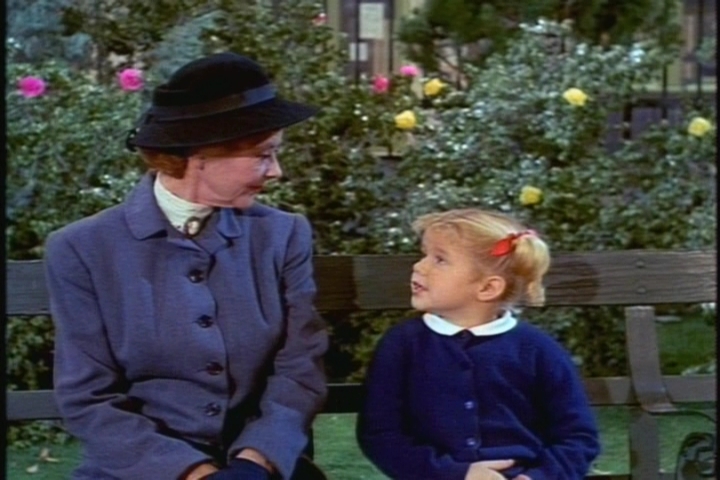 Random fashion note: I like Cissy’s suit and white gloves here.